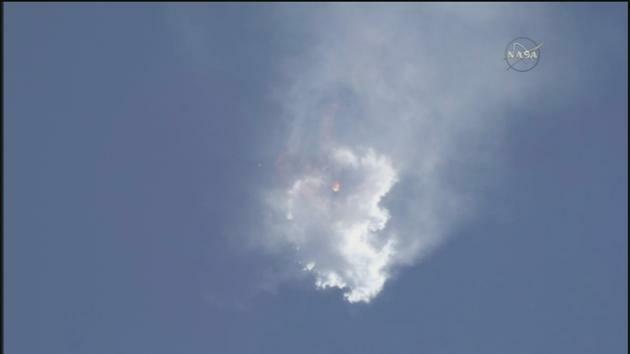 Following an on-time launch on June 28, a SpaceX Falcon 9 rocket carrying the Dragon cargo vehicle broke apart over the Atlantic Ocean. Approximately 139 seconds into the flight, just prior to the first stage separation, the vehicle disintegrated. Directly following the launch failure, Gwynne Shotwell, SpaceX COO and president, attributed the anomaly to an over-pressurization of the upper stage. The cause of the over-pressurization was unknown until the flight data had been analyzed. During a media teleconference today, SpaceX CEO Elon Musk emphasized that the findings are preliminary and will be further scrutinized. The results have been shared with the FAA and all of SpaceX’s commercial partners before they were shared with the public. Musk said everyone agrees the strut failure is the likely cause. So what exactly happened? The Falcon 9’s upper stage is fueled by RP-1 (a kerosene derivative) and uses liquid oxygen as an oxidizer. As the fuel is depleted, helium fills the tank to maintain pressure. There are several helium tanks in the upper stage, held in place by small stainless steel struts. The struts are certified to withstand up to 10,000 lbs of force; however, the faulty strut failed after sustaining 2,000 lbs—one fifth what it was rated for. As the stage accelerates and G forces rise, you would expect materials in the stage to be pushed down, but instead they want to float up. Buoyancy of materials within the stage increase proportionally to G ratings. So as more G forces are exerted on the rocket, the more buoyant the tanks inside become. The purpose of the struts is to keep the tanks in place. Over the course of Falcon’s history, several thousand of these struts have flown, all without issue. (The same struts are flown on both the first and second stage of the Falcon.) Data analysis and the use of acoustic triangulation point to one strut in the upper stage as cause of the failure. This support strut appears to have buckled at 3.2 G, allowing the tank to spew helium into the upper stage. Not long after the bottle broke free, data shows the flow of helium pinched off and pressures returned to nominal; unfortunately the damage had been done. Since the second stage was not yet operational, the fuel in its tank had not been used, and only a small amount of gas could have caused the LOX tank to over-pressurize. If the helium tank had ruptured, then the data would show a rapid release of gas, and that is not what the data shows. Going forward, SpaceX will switch strut suppliers and will test each and every strut prior to installation on the Falcon 9. In addition, the company will be upgrading the computer software on their Dragon cargo vehicle. Right now, both crewed and cargo Dragon are equipped with parachutes in case of an emergency; however, only the crewed version has the software equipped to deploy those chutes. Following the June anomaly, SpaceX reported that the Dragon cargo vehicle survived the incident and even received telemetry from the craft until it crashed into the Atlantic Ocean. If the cargo Dragon had been equipped with the same software as the crewed version, the chutes could have been deployed, and the vehicle and its over 4,000 pounds of cargo would have been recovered. During today’s teleconference, Musk said that all versions of Dragon will be equipped with this software in the future. SpaceX expects to return to flight within the next couple of months, most likely in September 2015. Musk is not sure which flight will launch first. Prior to the June failure, SpaceX’s next launch was scheduled for August 9 with the launch of NOAA’s Jason-3 satellite. The company expects no delay to their commercial crew endeavors; however, the first test launch of their Falcon Heavy rocket is expected to move to spring of 2016.